Our club was chartered June 13, 1945. For 70 years we have been tirelessly serving those in need in the Doylestown and the surrounding communities.. With projects ranging from Eye Glass and aluminum tab collections which are delivered to the Bucks County Assoc. 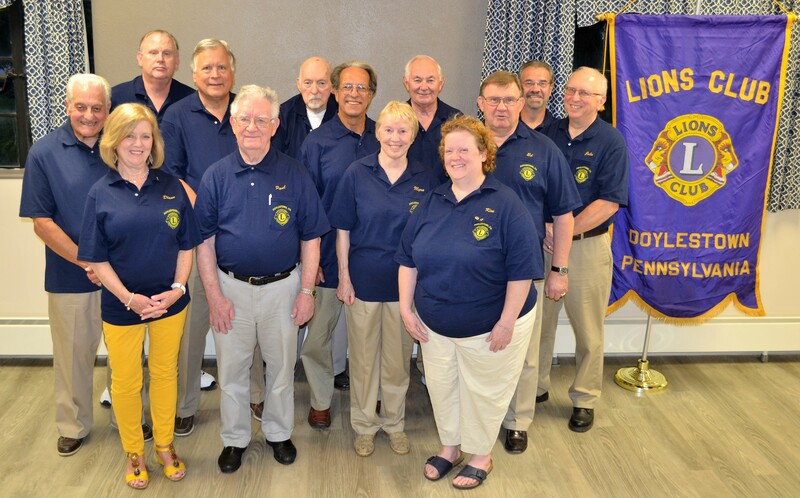 for the blind to children's eye screening, the Doylestown Lions Club is committed to bringing the unparalleled services of Lions Clubs International to our community. The Doylestown Club shows its commitment to area youth by providing eye glasses and exams to needy school children. We also provide food to the local food pantry. We provided many service activities to the community such as: highway cleanup, building a pavilion for the local YMCA., and providing funding to build the Sensory Trail at Central Park. The club belongs to Lions Clubs International, the world's largest service organization founded in 1917 by Melvin Jones and comprised of 45,000 Lions clubs worldwide. Throughout its proud history Lions Clubs International has brought unparalleled humanitarian services to more than 192 countries and geographic areas around the globe and all continents. You will find that membership in our Lions club will offer many opportunities for personal growth. Not only can you experience the incomparable feeling you receive from volunteering, but you will also have the chance to hone leadership, communication and organizational skills. You can develop friendships that last a lifetime, meet other Lions from all corners of the world and contribute ideas that will help our club be an even more valuable part of our community. Be our guest at our next meeting. Drop us an email at DoylestownLions@aol.com provide your name, phone number and email address so we may contact you. We invite Family participation in club's community events. As a family unit, you can receive a dues discount in membership when volunteering together in Lionism. This program applies to family members eligible for Lions membership in and/or joining the same club and living in the same household related by birth, marriage and other legal means - such as parents, children, spouses, aunts/uncles, cousins, grandparents and in-laws of spouses.